The Grettum Crew 714 was one of the original crews of the 492nd that trained in Alamogordo, New Mexico. They transferred in as crew 1633 from the 330th CCTS (Combat Crew Training School) in Biggs, Texas, on 3 Mar 44. No personnel changes were made at that time. They were assigned to the 857th BS, designated as Crew 714. Capt Grettum was assigned B-24J 44-40072. The crew nicknamed it the "B.T.O." (Big Time Operator). They flew their assigned ship to England via the southern route. Sgt Preston was sent over on the Queen Elizabeth in order to make room for their ground crew chief, T/Sgt Schillen. Crew 714 only flew one mission under Capt Grettum. He was reassigned to serve in the staff command. 2nd Lt Arthur Nelson, the co-pilot from the George Haag Crew 706, took over the crew. By our count, Nelson took Crew 714 on 25 more missions with the 492nd. We don't know if there were any substitutions on any of the missions, nor do we know if the bombardier was left behind on any of the pathfinder missions. 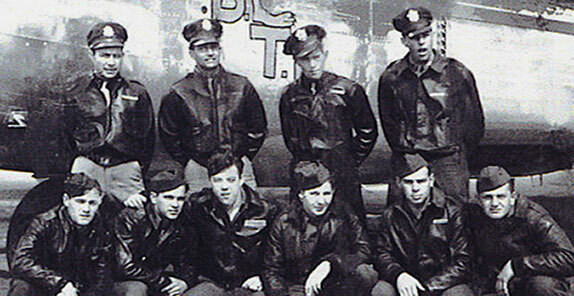 But this crew was still together when they transferred to the 448th Bomb Group, 713th squadron, on 10 Aug 44. See Nelson Crew 714. 11 May 44 44-40072 Mulhouse Target: marshalling yard.